AUBURN, WA. (May 21, 2009)-La Dolce Vita Automobili at Black Horse announced today that the event will be showcasing an impressive display of Lamborghini cars. The event continues to receive strong support across the Italian car community and exceptional cars are evident. “Fellow Lamborghini owners from all over are traveling to La Dolce Vita and bringing some amazing cars in just about every color and configuration imaginable”, notes Steve Gleaner, event sponsor and owner of Driven Exotics in Gilroy, CA. Both spectators and the Media will enjoy photographing several dozen examples of the famous Italian supercar. Convenient online ticketing at the www.ladolcevitamontereybay.com website has also been announced through services provided by Interactive Ticketing. Numerous car events are held around the world each year and many feature exotic cars. “Lamborghini cars always make a huge impact on the crowd when we take them to events and people of all ages love to see them”, remarks Roy Cats, event sponsor and owner of Cats Exotics in Everett, Washington. “Look at all the event coverage on the web and in magazines and you will see a strong focus on Lamborghini’s with their wings in the air and their sleek and powerful lines”. La Dolce Vita Automobili at Black Horse will feature a wide selection of beautiful Italian and other European cars, [such as Ferrari, Maserati, and Alfa Romeo] carefully displayed as art for the general public to enjoy along with great food, wine, music and vendor offerings. The event takes place on Friday, August 14 during Monterey Car Week, the most significant week on the global collector car calendar which attracts hundreds of thousands of serious automotive enthusiasts from around the globe. “We’ve chosen to work with Interactive Ticketing due to their expertise with events like the New York International Auto Show”, said Kerry McMullen, Co Founder of the event. “Anyone who purchases a spectator ticket can easily print out a bar-code ticket from their computer or order online and pick them up at one of our three Will Call tents at the event”. An “Early Bird Special” spectator ticket rate of $70.00 is in effect to the general public through June 15. Ticket holders receive a full-color, content-rich collectible event book. Free parking is also included along with air-conditioned shuttle to the front entry of the event. La Dolce Vita Automobili at Black Horse is family-friendly and will admit youth ages 17 and under free when accompanied by a paying adult. “We encourage adults to bring youth to the LDV so they can learn about great cars of the world and hopefully acquire a passion for collector cars that carries forward for years”, remarks McMullen. 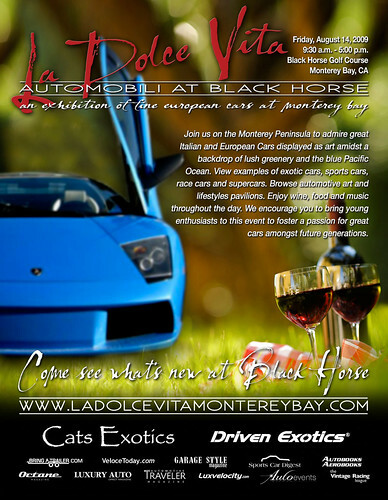 La Dolce Vita Automobili at Black Horse is the newest car event to be added to the 10-day timeframe known as Monterey car Week. The exhibition of Italian and European cars offers examples of vintage race cars, sports cars, exotics and supercars spanning decades of design and technology. On Friday, August 14, 2009 from 9:30 AM to 5:00 PM at Black Horse Golf Course, cars will be featured as art amidst a dramatic backdrop of lush greenery near the Pacific Ocean on the Monterey Peninsula during the most significant week on the global collector car calendar. A silent auction including automotive art, music, movie and sports memorabilia will generate funds for the La Dolce Vita Automobili Scholarship. Facilitated by Collectors Foundation, the scholarship will assist bright and talented students in their pursuit of a career in automotive design, shaping the cars of tomorrow. Have you subscribed to the new ‘Exotic Car Examiner’ column online yet? It’s COMPLETELY FREE and offers the fastest news in town.